Sand is a naturally occurring, finely divided rock, made up of small particles or granules called sand grains. It can vary in composition, but along non-tropical coasts and in inland areas, the most common constituent is silica (silicon dioxide). Sand is transported by wind or water and deposited in various forms, such as beaches, dunes, sand spits, and sand bars. In most deserts, sand is the dominant constituent of the soil. Under controlled conditions, sand is usually harmless, and children have fun playing in the sand. One must take appropriate precautions, however, when engaging in such activities as sandblasting. Extended inhalation of fine silica particles can cause a lung disease called silicosis. Sand dunes along shorelines play an important role in protecting the land from the potential devastation of storm waves. On the other hand, the migration of sand dunes threatens cities and agricultural lands in Africa, China, and the Middle East. Sand is used in preparing concrete and manufacturing bricks, and it is sometimes added to paint to obtain a textured finish. It is also useful in landscaping, to make graded slopes and hills. Sandbags offer valuable protection against flooding and gunfire. Sandy soils are ideal for some crops, including peanuts, peaches, and watermelon. In geological terms, sand consists of particles ranging in size from 0.0625 (or one-sixteenth) to two millimeters in diameter. Geological material in the next smaller size class is called silt, consisting of particles below 0.0625 millimeters down to 0.004 millimeters. 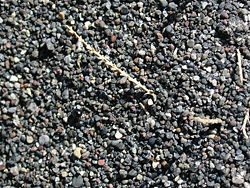 Material in the size class just above sand is called gravel, with particles ranging from two millimeters up to 64 millimeters. Sand feels gritty when rubbed between the fingers, while silt feels like flour. The composition of sand varies according to local rock sources and conditions. In inland continental settings and non-tropical coastal settings, the most common constituent of sand is silica (silicon dioxide), usually in the form of quartz. Given its chemical inertness and considerable hardness, silica is quite resistant to weathering. The bright white sands found in tropical and subtropical coastal settings are ground-up limestone. Arkose is a sand or sandstone with considerable feldspar content, derived from the weathering and erosion of a nearby granite. Some locations have sands that contain magnetite, chlorite, glauconite or gypsum. Sands rich in magnetite are dark gray to black in color, as are sands derived from volcanic basalts. The chlorite-glauconite bearing sands are typically green, as are sands derived from basalts (made from lavas) with a high olivine content. The gypsum sand dunes of the White Sands National Monument in New Mexico are famous for their bright, white color. Sand deposits in some areas contain garnets and other resistant minerals, including some small gemstones. The study of sand is called arenology. The study of individual grains can reveal quite a bit of historical information about the origin, type of transport, and so forth of the grain. Quartz sand that is recently weathered from granite or gneiss quartz crystals will be angular. It is called sharp sand in the building trade, where it is preferred for concrete mixing, and in gardening, where it is used as a soil amendment to loosen clay soils. Sand that is transported long distances through erosion by water or wind will be rounded, with characteristic abrasion patterns on the surface of the grains. In physical geography, a dune is a hill of sand built by eolian processes—that is, processes involving the activity of winds. The wind can erode, transport, and deposit materials, and it can change the location and size of a bare dune. The "valley" or trough between dunes is called a slack. An erg (or sand sea or dune sea) is a large, relatively flat area of desert covered with sand, with little or no vegetation cover. Technically, an erg is defined as a desert area that contains more than 125 square kilometers of wind-swept sand, where the sand covers more than 20 percent of the surface. Smaller areas are known as dune fields. The Sahara contains several ergs. Some coastal areas have one or more sets of dunes running parallel to the shoreline directly inland from the beach. In most such cases, the dunes are important in protecting the land against potential ravages by storm waves from the sea. Dunes are widely distributed in coastal regions, but the largest complexes of dunes are found inland, in dry regions and associated with ancient lake or sea beds. Dunes also form under the action of flowing water, such as on the sand or gravel beds of rivers, estuaries, and the sea. Crescentic: The most common dune form on Earth (and on Mars) is the crescentic. The width of the mound is generally greater than its length, and the slipface is on the concave side of the dune. These dunes form under winds that blow from one direction, and they are also known as barchans, or transverse dunes. Some types of crescentic dunes move faster over desert surfaces than any other type of dune. The largest crescentic dunes on Earth, with mean crest-to-crest widths of more than three kilometers, are in China's Taklamakan Desert. 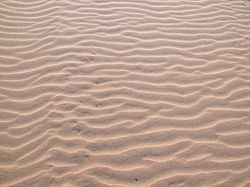 Linear: Straight or slightly sinuous sand ridges, typically much longer than they are wide, are known as linear dunes. They may be more than 160 kilometers long. Linear dunes may occur as isolated ridges, but they generally form sets of parallel ridges separated by miles of sand, gravel, or rocky interdune corridors. Some linear dunes merge to form 'Y'-shaped compound dunes. Many are formed in places where the wind blows bidirectionally. Star: Radially symmetrical, star dunes are pyramidal sand mounds with slipfaces on three or more arms that radiate from the high center of the mound. They tend to accumulate in areas with multidirectional wind regimes. Star dunes grow upward rather than laterally. They dominate the Grand Erg Oriental of the Sahara. In the southeast Badain Jaran Desert of China, the star dunes are up to 500 meters tall and may be the tallest dunes on Earth. Dome: Dome dunes are oval or circular mounds that generally lack a slipface. They are rare and occur at the far upwind margins of sand seas. 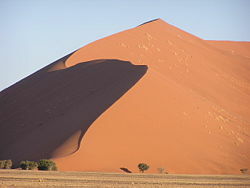 Parabolic: 'U'-shaped mounds of sand with convex noses trailed by elongated arms are well-known in coastal deserts and are called parabolic dunes. Sometimes they are called 'U'-shaped, blowout, or hairpin dunes. Unlike crescentic dunes, their crests point upwind. The elongated arms of parabolic dunes follow rather than lead because they are fixed by vegetation, while the bulk of the sand in the dune migrates forward. Longitudinal and transverse dunes: Longitudinal dunes, also called seif dunes, elongate parallel to the prevailing wind, possibly caused by a larger dune having its smaller sides blown away. Seif dunes are sharp-crested and are common in the Sahara. They range up to 300 meters (900 feet) in height and 300 kilometers (200 miles) in length. Seif dunes are thought to develop from barchans based on changes in the directions of the wind. A transverse dune is horizontal to the prevailing wind, probably caused by a steady buildup of sand on an already existing, small mound. Reversing dunes: Occurring wherever winds periodically reverse direction, reversing dunes are varieties of any of the above shapes. These dunes typically have major and minor slipfaces oriented in opposite directions. All these dune shapes may occur in three forms: simple, compound, and complex. Simple dunes are basic forms with a minimum number of slipfaces that define the geometric type. Compound dunes are large dunes on which smaller dunes of similar type and slipface orientation are superimposed, and complex dunes are combinations of two or more dune types. A crescentic dune with a star dune superimposed on its crest is the most common complex dune. Simple dunes represent a wind regime that has not changed in intensity or direction since the formation of the dune, while compound and complex dunes suggest that the wind's intensity and direction have changed. 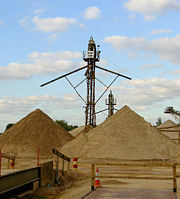 Sand is often a principal component of the aggregate used in the preparation of concrete. Sand manufactured at rock crusher plants for use as an aggregate is called mansand. Graded sand is used as an abrasive in sandblasting and is also used in media filters for filtering water. In the manufacture of bricks, sand is used as an additive with a mixture of clay and other materials. Sand is also sometimes mixed with paint to create a textured finish for walls and ceilings, or a non-slip surface. Sandy soils are ideal for certain crops such as watermelons, peaches, and peanuts. In addition, these soils are often preferred for intensive dairy farming because of their excellent drainage characteristics. In landscaping, sand is added to make small hills and slopes, such as for making golf courses. It is often transported to popular beaches where seasonal tides may sweep the original sand into the sea. Sandbag s are used for protection against flooding and gunfire. They can be easily transported when empty, and filled with local sand. Sand castle building is a popular activity and there are even competitive sand castle building competitions. Sand is generally harmless under controlled conditions, but one must be careful when engaging in some activities such as sandblasting. For this reason, bags of silica sand now typically carry labels warning the user to wear respiratory protection and avoid breathing the fine silica dust. In recent years, workers have filed a number of lawsuits seeking damages after they developed silicosis, a lung disease caused by inhalation of fine silica particles over long periods of time. 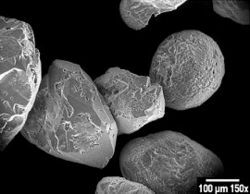 The material safety data sheets (MSDS) for silica sand state that "excessive inhalation of crystalline silica is a serious health concern." A different hazard arises when digging tunnels or "caves" in large dunes, sandhills, or beaches. People have been severely injured and even killed when the cave or tunnel collapsed upon them. One of the biggest problems posed by sand dunes is their encroachment on human habitats. Sand dunes are moved by a few different processes, helped along by the wind. One way that dunes can move is through "saltation," where sand particles skip along the ground like a rock thrown across a pond might skip across the water's surface. When these skipping particles land, they may knock into other particles and cause them to skip as well. With slightly stronger winds, particles collide in mid-air, causing sheet flows. In a major dust storm, dunes may move tens of meters through such sheet flows. Like snow, the dunes may also move by sand avalanches, falling down the steep slopes of the dunes that face away from the winds. Sand threatens buildings and crops in Africa, the Middle East, and China. Drenching sand dunes with oil stops their migration, but this approach hurts the environment and uses a finite resource. Sand fences might also work, but researchers are still trying to figure out the best possible fence design. Preventing sand dunes from overwhelming cities and agricultural areas has become a priority for the United Nations Environment Programme. ↑ Silica Sand MSDS, J. R. Simplot Company. Retrieved August 29, 2007. Nouakchott, Mauritania. NASA Earth Observatory. Retrieved August 29, 2007. This page was last modified on 18 August 2015, at 14:42.